Summer is in full swing now and I don’t know about you, but I have been eating salads just about every day! 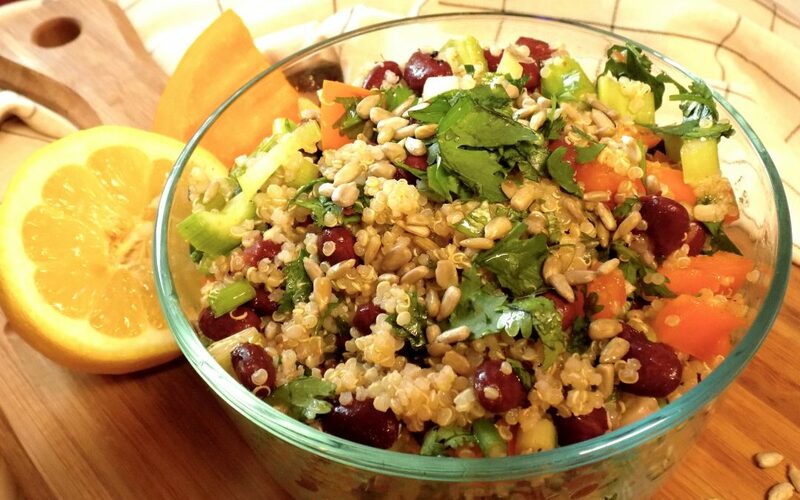 Especially this Zesty High Protein Bean and Quinoa Salad! It is chock-full of plant-based protein, healthy fats, and tons of flavor! 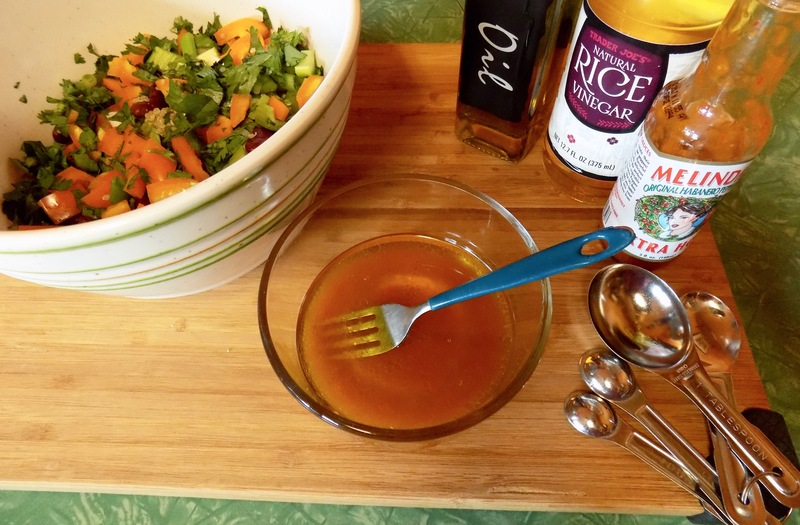 It is by far my favorite go-to summer salad! Salads are the perfect meal for summer because not only are they light and refreshing, but they are full of the freshest produce available! As the summer proceeds, more and more fruits and veggies are ripe for the picking, and that means a greater variety of salads we get to eat! 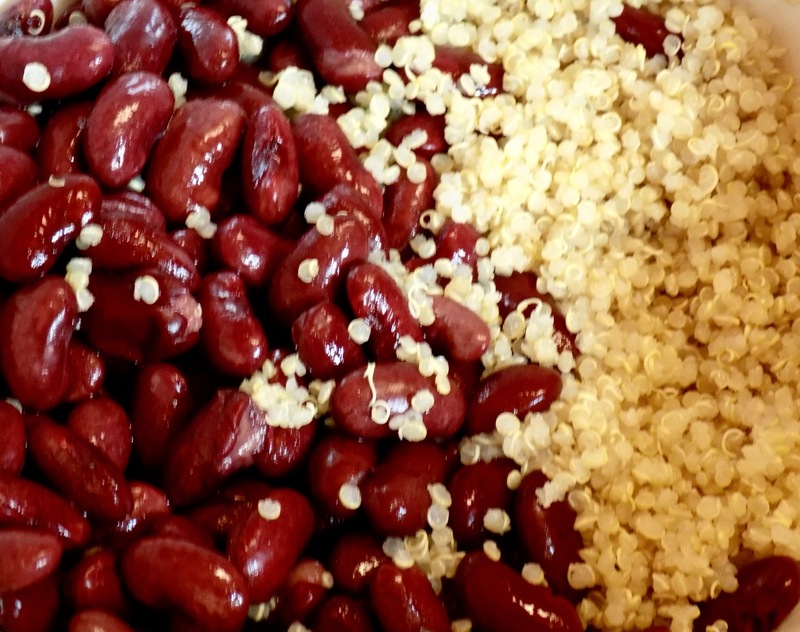 This recipe highlights beans and quinoa – two high protein ingredients that are very filling. A little goes a long way! I have been reading a lot lately about protein needs in an effort to answer the question that every vegan/vegetarian gets at some point, “Where do you get your protein if you are not eating meat?” (and especially if you don’t eat dairy either!) As it turns out, it is quite easy to get enough protein to meet your daily needs by eating only plant-based foods! 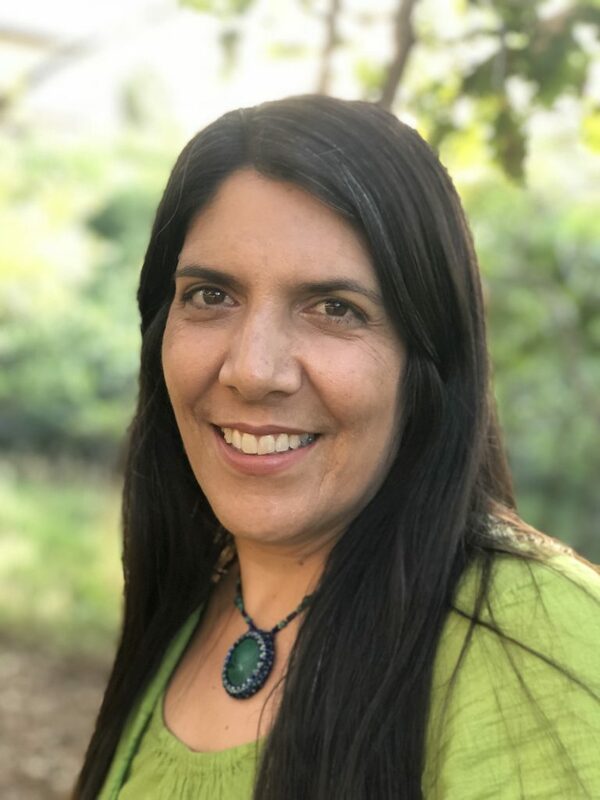 This means getting your protein from veggies, fruits, beans and legumes, nuts and seeds, grains, starches (think sweet potatoes), as well as foods made from these products. All of these foods have some protein in them – some of them have a lot (like beans, with 15g per 1/2 cup serving)! 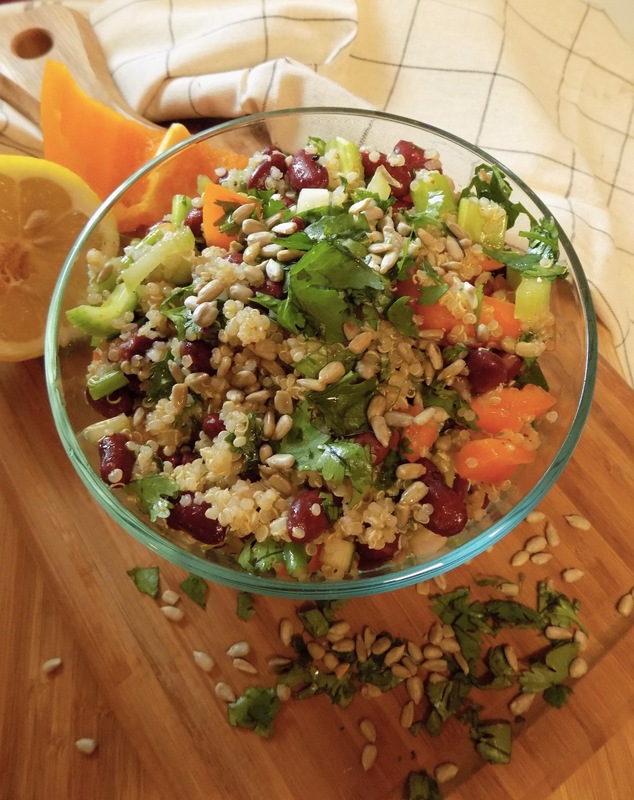 This high protein salad features red kidney beans and quinoa (each has 5g protein per 1/2 cup), with the addition of sunflower seeds (with 6g of protein per 1/4 cup). That’s about 24g per serving of this salad as a side dish, or 48g of protein if you eat it as a meal (like I do!). It is almost enough to fulfill the recommended requirement of 66g of daily protein for adults! It also has plenty of healthy fats such as avocado, olive oil, and sunflower seeds, as well as lots of healthy fiber! 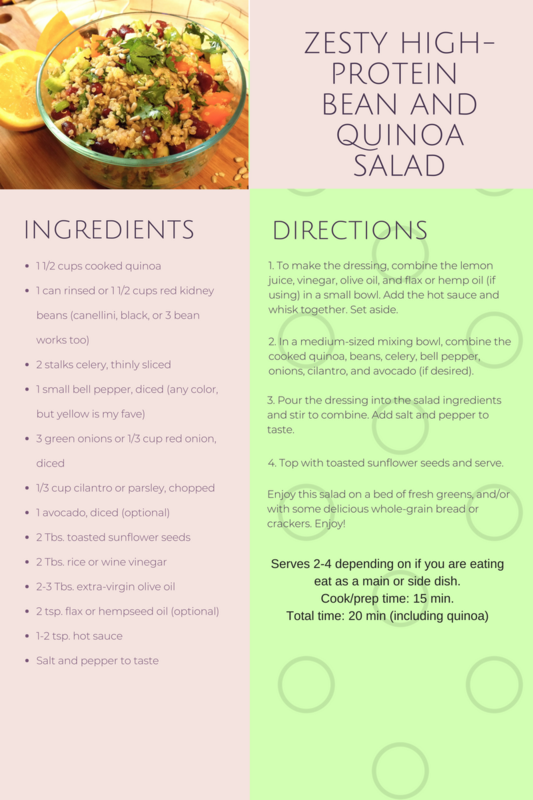 So, if you are new to veganism or vegetarianism, or if you are simply wanting to add more plant-based high protein foods to your diet, this is the salad for you! 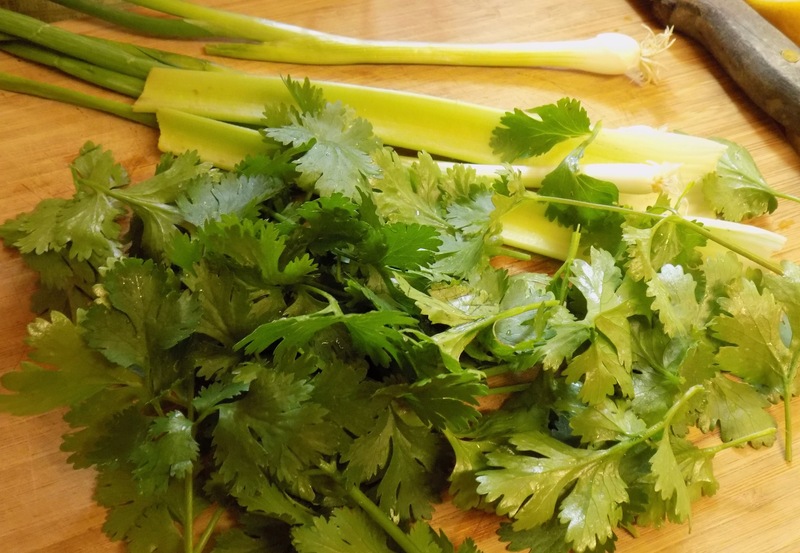 It is also high in fiber and vitamins, it is simple to make, and totally refreshing and delicious! Make it for your family as a side dish, take it to a BBQ, picnic, or potluck, or just eat it as a meal prep item for lunch. Any way you eat it, you’re going to love it, and your body will too!